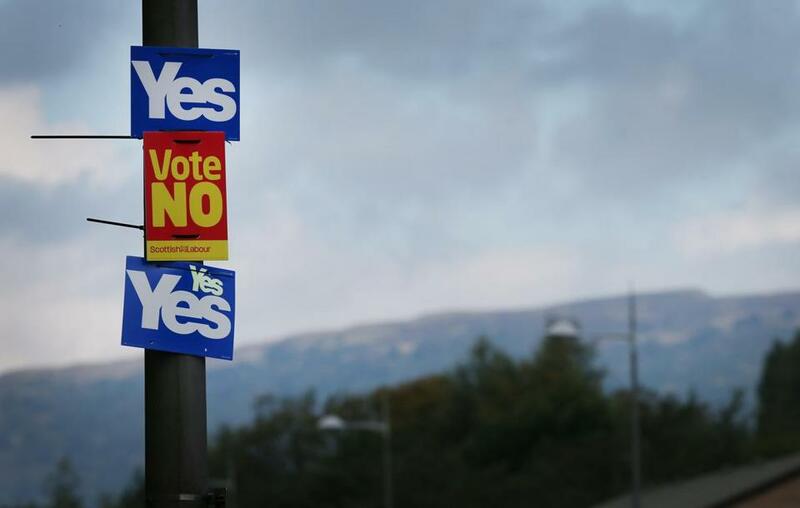 Yes and No campaign placards adorned a lamp post in sight of the Campsie Fells in Glasgow on Tuesday. LONDON — With Thursday’s referendum looming, proponents of Scottish independence are using one of the main weapons in their armory — Scotland’s widespread mistrust of the Conservative Party. The Conservatives, also known as Tories, have been in power in the United Kingdom more often than not since the end of World War I. For a while, Scotland was even a bedrock of support — in the 1955 general election the Conservatives won half the vote and seats in Scotland. By 1997, when Tony Blair led the Labour Party back to power after 18 years in opposition, the Conservatives were wiped out in Scotland. In the last election in 2010, which resulted in a Tory-led government across the U.K., the Conservatives claimed one seat out of 59 in Scotland. The party’s unpopularity in Scotland is now so great that it could prove to be the swing factor in this week’s Scottish vote over the future of the union with England, Wales and Northern Ireland. While Conservative Prime Minister David Cameron has urged Scots not to use the referendum to give the ‘‘effing Tories’’ a kicking, the Yes campaign is trying to tap into that desire. ‘‘A Yes means Scotland’s future in the hands of people who live here — so no more Tory governments we didn’t vote for,’’ Scotland’s First Minister Alex Salmond said. How have the Conservatives become a recruiting sergeant for the Yes campaign? The Conservatives’ drop in support in Scotland can be traced back to 1979, when Margaret Thatcher won the general election and began 18 years of Tory rule. Successive Conservative governments introduced policies to turn around the U.K.’s economic fortunes. Though the reforms reduced the role of the state and helped private enterprise to flourish, particularly in financial services, there were also lots of negative repercussions. Millions lost their jobs as industries like mining and shipbuilding, which had been foundations of Britain’s economy since the industrial revolution, were decimated. The effects were particularly pronounced in Scotland, just as revenue was coming in from North Sea oil and gas. The Yes campaign argues that the bounty was wasted paying for the social costs of the Conservative policies, like unemployment benefits, and on tax cuts for the rich. Though the oil production peak has passed, the campaign says an independent Scotland can still set up a ‘‘rainy day fund’’ in the way Norway has. In 1989, Scotland became a testing ground for one of Thatcher’s more contentious reforms. The ‘‘poll tax’’ — a levy on individuals that was the same regardless of income — was introduced to replace the previous funding system for local government. It was rolled out to England and Wales a year later. Much of Scotland, which hadn’t backed the Conservatives in the previous three elections, was left fuming for being singled out. In 1990, Thatcher was toppled by her own party, partly because of the backlash against the poll tax, which was soon scrapped. The decision to target the Scots remains toxic for the Conservatives. As desire in Scotland for greater political independence grew, the Conservatives lost further support there by opposing the devolution of powers. Most British parties backed the idea of a new legislative body in Edinburgh that would have a say on policies such as health and education. But the Conservative Party under John Major, who replaced Thatcher as prime minister, argued that the establishment of a Scottish Parliament would create a ‘‘slippery slope’’ to independence. In 1997, Blair’s Labour government supported devolution, which was overwhelmingly backed by Scots in a referendum. The Scottish Parliament opened two years later, to the glee of Salmond, who, like Major, said it brought the day of independence nearer. 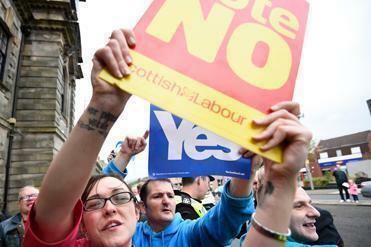 For Scots, the outcome of the 2010 general election was a reminder of the 1980s and 1990s. Conservative Prime Minister David Cameron formed a government with the support of the Liberal Democrats even though his party won only one seat in Scotland. Though powers have been devolved to Edinburgh, London still holds sway on most economic matters. The government has introduced policies that Scotland didn’t ostensibly support, notably big cuts to government spending. The Yes campaign says it can bring such austerity to an end. The social backgrounds of Cameron and his economy minister, George Osborne, have arguably made the austerity issue more toxic in Scotland than it otherwise might have been. While Thatcher was the daughter of a grocer and Major the son of a trapeze artist, Cameron and Osborne are distinctly posh and privileged. They attended some of England’s most prestigious private schools and were members of the ultra-exclusive Bullingdon Club while studying at Oxford. Their particular type of English aristocracy — often labelled as Tory toffs — only serves to accentuate their ‘‘foreign-ness’’ to many Scots. It’s a charge Cameron appears to get. ‘‘If you don’t like me, I won’t be here forever,’’ he said Monday in a plea for Scotland to remain part of the union.